Would you like to see some of the most fascinating buildings of Art Nouveau? Come and visit these unique attractions in Budapest! You will learn a lot about our great historical period and will be fascinated by the magnificent buildings of Art Nouveau! Take part in a 2 hour walking tour and discover the history of Hungarian Art Nouveau from 1890 to the early 20th century! Our English speaking tour begins with visiting the House of Hungarian Art Nouveau. The whole museum - outside and inside as well - was devoted to the Secession style. (Art Nouveau is called Secession (szecesszió) in Hungarian). While admiring the furniture, paintings, interiors and porcelains displayed here, you can experience the atmosphere of bourgeois life of Budapest at the beginning of the 20th century. The whole building and every piece of collection show lavishly decorated designs of this period. We are sure that the Museum of Applied Arts with Zsolnay terracotta tiling decoration catches your eye from a long distance. One of the capital’s architectural gems was influenced by Hungarian folk art. The museum was built by Ödön Lechner, the most important figure in Hungarian Art Nouveau. The Post Office Savings Bank with its stunning cornice and extravagant roof decoration is another example of the diversity of Lechner’s art. When asked, why he had put such effort into designing the tile patterns of the roofs that nobody from the streets would be able to see, Lechner replied „ the birds would see them”. 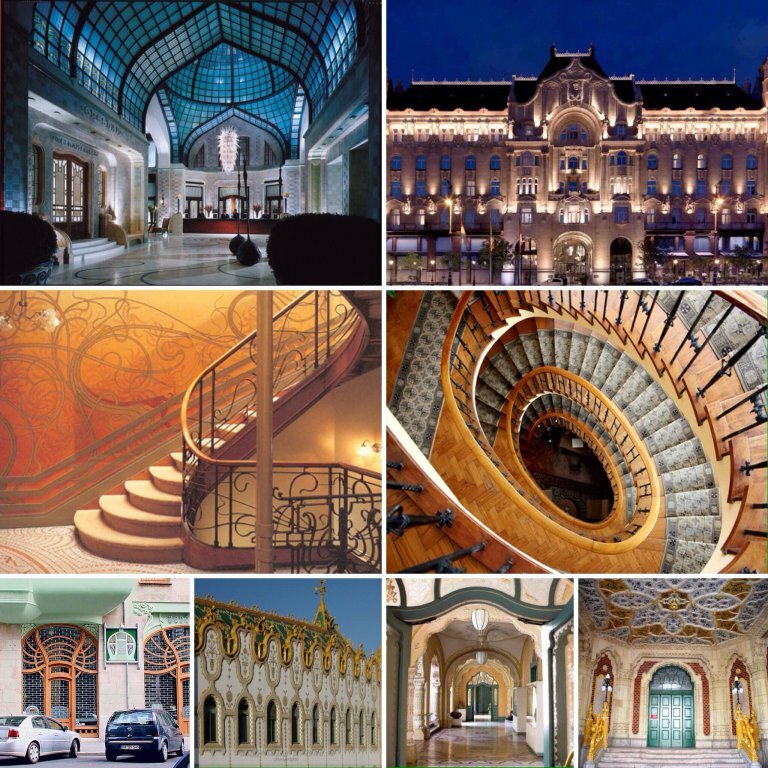 In the city center you can see one of the finest examples of Art Nouveau in the world, the Gresham Palace. It was built in 1904 as the London-based Gresham Life Assurance Company’s headquarters. In 2001 the building was reborn as a luxury hotel. Due to restoring such original details as a large staircase, stained glass, mosaics, ironwork and winter gardens, we can admire the incredible richness of Hungarian Art Nouveau at present, as well.